Have you had a reading with Thomas John? There are of course, others who HAVE had positive experiences with Thomas, and have been impressed with this readings. Have you had a reading with Thomas John> If so…..let us know what your experience has been like, so others can get a feel for his process, his accuracy and his credibility in general. You can read some of his reviews at the links below. I also have to add the lack of professionalism with this man. (see other posts below) I pre-paid for a reading for my sister through Pay Pal in January of 2015. I was told at the time the wait would normally be one year to 18 months. That time period has passed and so after the 2nd attempt to ‘reschedule’ by his assistant I requested a refund. I was told a refund would be issued however after a month I called again and also followed up with Pay Pal. Pay Pal contacted his assistant who called and got my address. Again…no check came. I started an email campaign to document including Pay Pal in each email I sent. Today, the refund has finally arrived in the mail…the day AFTER the 3rd contact was made from his assistant trying to reschedule again. I think this man has no business integrity by making multiple appearances for group events to drum up business then not honoring the customers who paid for his services. 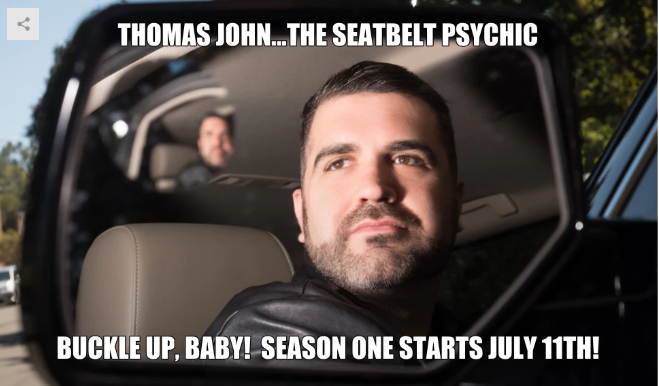 Thomas John is featured in a brand new show (the Seatbelt Psychic) that looks like it’s going to be a lot of fun, and very popular 🙂 Have you had a reading with Thomas? If so…..check out his profile on our community and let us know how it went! Alternatively, you can leave a Thomas John reading review, anywhere in the comments below. Check out the articles by Susan Gerbic at the Skeptical Site CSI. They built a FACEBOOK trap…and Thomas John got busted. Thank you for sharing this, Peter – it certainly paints an unflattering portrait – and seems to coincide closely with many of the experiences others have reported as well. (as clearly, there are many folks who seem to believe that Thomas did advanced research on them prior to their interactions with him – which feels to me – like a betrayal of trust that is hard to come back from) At a quick glance – the most damning piece of the “trap” was actually the “student” who got a reading – in the spirit of (no pun intended 🙂 lending credibility to Thomas’s evidential accuracy. This is inexcusable to me – and if true – is the quintessence of dishonestly. That said – I’m not sure I’m a fan of Susan’s writing chops – or storytelling skills – there is much that feels dense and difficult to follow in her account of what happened – and while I certainly believe her account – i’m not sure she does a service to the general reader – who will find the choppiness of her account – and the various ways they “blinded” themselves to the FB content and characters – quite difficult to navigate and understand. We’ve seen many positive reviews of Thomas John – and there are people I know personally – who like him – and think he has a special gift. To my eye – the old stories that paint an unflattering picture of his ethics and approach in other life domains is more than enough to provide fair warning – and nothing I’ve seen since – has shaken that sense. Much appreciate you sharing – and hope folks here – who do want to believe – are open minded enough to read the article as well. I have had a few readings with Thomas John, group demonstrations, small group readings and a one on one. All times I received a reading and the information was 100% accurate and none of this was on the internet. As well, I didn’t purchase my tickets under my name, my friend bought the tickets for the group and small group readings so he had no way to look me up on the internet at all. The one on one reading I booked and he told me things I couldn’t confirm as I didn’t know, after asking family it was true. He also didn’t know that my husband would be in the one on one reading and he gave him such accurate information as well, and again nothing was on the internet as my husband and his family are all not into social media and very private people. I think that he is a sevant medium and he gets so much information, more than any medium I have ever seen that it makes people think it can’t be real and looking for ways to prove he is a fraud. I also don’t think he knows how to handle the business side of his work and he doesn’t have key people in place who are helping him. Like many mediums he is not good with business. That’s my opinion he is the real deal, he is one of the most accurate mediums I have ever witnessed and he is worth the 3 yr wait. I waited almost that long for my one on one which was rescheduled 3 times before I finally got it and it was worth it. Thanks for such a well written and detailed comment and for sharing your experience, Kelleu – it will be very helpful to many – and I think you capture something exceptionally insightful and important – that business acumen doesn’t always come as a package deal 🙂 (If I shared some of the behind the scenes stories we deal with through our community – with otherwise quite impressive professionals – who occassionally do shockingly silly things from a “spiritual business” standpoint – it would be equal parts amusing – and horrifying to hear 🙂 Thanks again! Now this scammer has his own TV Show…Mi cyaan believe it ! This will give him even more grieving & willingly paying victims for his readings ! Most certainly this show is staged…would be nice if ever an insider (staff member) of such a show (anonimously) gave information on how the “magic” came about ! Gina I was part of about an 80 person group reading about a month ago and another one tonight of about 60 with Thomas John. The first reading opportunity came about his looking for a one on one complimentary reading. I emailed as directed and was told it was filled but would be given comp tix for a group. After 4-5 emails, I was provided the location and took my husband who really doesn’t believe in mediums. Thomas did choose me for a reading and both of us were surprised with some of the information he imparted about my Mom, father, children and myself. I went back to my social media to see what is out there he could have obtained and did find one piece that gave info. If he did do digging, he really had to go back more than two years. He surprised me with info on a child I had given up 46 years ago and that my grandparents were Native American. Tonight I took my daughter again based on an opportunity to have a single reading but instead getting comp tix to a group reading. And again 4 emails back and forth and requesting her name and mine. He selected my daughter about an hour into the event. Same info on my Mom who is deceased, nothing about the child I gave up, but did bring up her recent infertility issues. He told her my Mom said she would get pregnant and she was helping her with that. If he is scamming (she had posted on social media of her miscarriages), that is a horrible thing to tell her. He also brought up a deceased person that had abused her. I am hoping court records are not available on that as I was informed by the district attorney they were not but who knows. So I am a bit more skeptical than before and certainly wonder if his advertising to have personal readings is to only to get you to come to the group and have time to delve into your information. He did advertise small group readings for $175 and his assistant was taking payments right there. Tonight he did allow people to record him which his website states he doesn’t allow. By the way, he made no reference that he had read me only a month ago which I thought was odd. Wow your account is so interesting. I have always wondered why Thomas would regularly ask for volunteers for free private mediumship readings that happens in the same area where he gives a group gathering event. It does absolute sense now. In fact, he never gives those readings. He offers complimentary tickets to those who have interesting information on their social media so that he can choose them for a reading. I guess those people are a kind of backup in case he has difficulties with reading the other attendees. About the child you gave up 46 years ago: is there a possibility that the child is registered as one of your relatives in people search directories? When you go on google and type 2 or 3 names that are connected to you, you land up on websites like mylife, spokeo, cubib, beenverified that shows the rest of your relatives, parents, grandmother, grandfather, etc. and even colleagues. Did you talk about that child to FB friends, family or are you part of a forum or FB group in which you could have shared that part of your life? After years of practice, Thomas is very good at retrieving information that you would never thought existed. Usually 100 % of the data he delivers are searchable online. But it does happen that, for a few individuals, he says things that I have trouble finding online. Are those cold/hot readings (as the experts say), real psychic hits or does he have a subscription to websites on ancestry, public records? I don’t know. Thank you for your comments. My experience was so odd. I am a true believer and I have so many of my own experiences and intuition but I am no pro and I want validation. I went in such a believer and when I walked out of the reading I had a pit in my stomach. Something felt so wrong even though I wanted to hold on. When I got home and reread the obituary in addition to to doing a simple google search I got the answers I needed. What really bothered me is he stated facts. And all were easily accessible. Then he made some off the cuff comments that were extremely evident and obvious when I looked at the search and obituary. He assumed in the reading that my living brothers wife and son were my deceased brothers family. Looking at a search it looks that way and the actual obituary could also read that way. He continued to comment about “Native American”. Then in the search my brothers name and “The Chieftan”. That’s the name of the local newspaper where we grew up and my parents still live. Who ever gave him that information assumed he was some how affiliated with a tribe. While that was my scientific “validation” that Thomas John is a fraud, the real validation came in that he mentioned 18 facts. All of which are public knowledge but there are seriously thousands of tidbits he could have related that were relevant and knowing my brother would have been communicated with feeling and meaning and personality. I believe it was a learning in trusting my gut and going with my intuition. That was my true gift from the reading. As for TJ, If he can help people and give them peace and solace all the power to him and I am happy for those he helps. As for me he is a fraud and the pity is he left me with some new skepticism and gives a bad name to the legit mediums. But I trust my gut and got validation when I got home. It was pretty easy too. The fact that he has been convicted of fraudulent practices in the past then launched a PR campaign to clean his past makes me question his real integrity. I think once a big con always a big con. See Thomas John Flanagan Chicago Craig’s list scams. Hi Gina (and anyone else who may feel the same way!) – I think one of the real epiphanies worth having on the spiritual path, is the one that realizes that there CAN be a capital T “truth” – (e.g. – that there is a spiritual component to life – and that we are bigger than our bodies and something mysterious and magical happens at death) – and there can be many people who claim to “own” that truth in some special way that are opportunistic – self serving and ultimately slimy. I have no opinion on Thomas John as a medium – he’s not someone that appeals to me purely from a gut level instinct – but the one thing I do know for sure – is that millions of people have incredible – inspiring – life changing experiences that point to that truth – every single year – across cultures and continents – and that all of those experiences are the best form of “proof” or evidence that there is much more to the human experience than meets the eye. I’ve interviewed hundreds of people who have had NDE’s for example – as part of our work here – and to me – the authenticity of THOSE accounts – the honesty and transformative benefits you can feel from those folks – that’s the sort of authentic spiritual experience we should all be interested in – and the best antidote to that sinking feeling that someone who claims to be “special” or “gifted” is really running a con 🙂 (again – without passing judgement on anyone in particular) I’m agnostic about mediums – having spoken to countless ones here on our community – but i’m 100% convinced that what mediums purport to do for us- is available to all – and in a way that removes the need to look elsewhere for affirmation – as well. Hello. I was part of an eight person reading recently. Funny most people say they are sceptics when they walk in and then believers when they walk out. I am the total opposite. I am a believer and walked out so disappointed! Thomas had numerous points to make about one spirit. All data were plucked from the obituary. Certain assumptions were also made erroneously and came from a misinterpretation of information found there. Had he been able to communicate with spirit they would have absolutely provided validation other than very publicly available information and errors. I also highly suspect he was being provided I formation via ear bud during the reading. I did not see it, but I am in production and I know these things. It did not occur up me until after because I was in such an emotional state during the reading. I would like to know what others think. Most in my group were repeat visitors and trust that he was real deal! I am not even suspicious, I am convinced he is a phony! Hello Goodkarma I love your screen name. Yes I am surprised as well! I believe I am pretty intuitive and I really believe that people have this gift. I went in to the reading very positive and open to hearing messages. I also trusted and believed that the reading would offer me something of a validation. I held on to that hope so much and wanted to believe that he had reached them and was communicating. Thomas was able to tell me a lot of detail which were true but were very public and easily accessible. Yes I signed up for the meeting over a month ago and provided name address credit card etc. I understood that he would probably research and that didn’t bother me at all. I wasn’t looking to hear that public Information, rather one of hundreds tidbits he could have given as validation. Seriously hundreds!! I mentioned I was emotional in the reading, very and so I wasn’t being rational. I so wanted to have communication with my beloved. Thomas also focused on one thing I found odd “Native American” and mentioned it twice. When I commented it may have been a joke between us (that was actually relevant) he said NO it’s something different. then asked about my brothers wife and son by name. When I went home and read the obituary and actually did a google search, his obituary came up next to the name of our local newspaper that has a Native American name. If one is not familiar with that as the local Newspaper, they may assume he was a member or leader of that group! (I made screen shots). Additionally, in the same search and obituary, it looked as though the spirit was the one married to my sister in law and father of my nephew rather than my other living brother. It became extremely apparent that this had happened! He said my mother was there early on and mentioned her by name (in obit) later when I asked about her he said he’d come back to me. This happened to several folks but when I went back and listened to the recording in a rational state of mind, it was quite suspect and I really believe it possible someone was talking to him (other than spirit) and feeding him info and names. I am pretty intuitive and have had hundreds of experience with both who came through that would have validated any connection. I later learned about his past and I love that he is/was a drag queen! I also believe people make mistakes and change but the nature of his past con schemes ring too similar to what I experienced. I also don’t see that behavior necessary nor typical of a University of Chicago type. Those are my opinions. I am sorry, I liked him. I wanted to believe him but he didn’t make it happen. I wasn’t a skeptic until I met him. That also makes me sad!